Visitors to Glastonbury Tor are often understandably concerned about the availability of lavatories. After all, who wants to have their visit to this mystical peak cut short because of the need to search for a loo? Prior to the closure of St Michael’s Prison, the lack of toilet facilities wasn’t such a problem, because under certain circumstances visitors were allowed to use the facilities at the jail. But with their disappearance, the lack of toilets within 32 miles of Glastonbury Tor has started to create difficulties for visitors with weaker bladders. And because of government cuts the free Park And Pee bus shuttle service has been suspended. This entry was posted in Uncategorized and tagged park and pee, St. Michael's Prison, toilets, Town Council B on by revsorg. For many years scientists have been mystified by the all-male population of Somerset Stranglers – the breed of hamsters native to Glastonbury Tor. The big question has always been how do they reproduce? Religious teaching has been that they engage in virgin birth, explaining why so many hamsters are depicted in the stained glass windows of churches in Glastonbury. Historically the scientific community has not challenged this idea out of respect for the hamster’s right to privacy. Local byelaws make it illegal to film these adorable animals during what might or might not be their mating season. But the mystery of how Somerset Stranglers reproduce may have finally been answered thanks to recent coppicing of the wooded area on the dangerous north face of the Tor. Police have received a higher than normal number of reports of a giant creature. Nervous villagers have responded in the traditional way by screaming “Ultrabeast!” as they run home, lock their front door and hide behind the sofa. But a new generation of visitors to Glastonbury have been able to give police a description. Visitors to Glastonbury Tor should be reassured that there have been no reports of the Ultrabeast attacking humans so it is probably perfectly safe to visit the area. However, if you take a picnic onto the tor you should keep any bags of peanuts double wrapped as they cause aggressive behaviour in male Somerset Stranglers and this could be a hideous problem when scaled up to the proportions of a queen hamster. This entry was posted in Glastonbury Tor and tagged adorably weak forearms, Chief Inspector Wilkinson, delved too deep, escape tunnel, glastonbury constabulary, Glastonbury Tor, hamster, hamsters, local byelaws, peanuts, Somerset Strangler, Somerset Stranglers, St Michael Prison, St. Michael's Prison, stained glass, tunnels, Ultrabeast, virgin birth on by revsorg. After spending over 5,000 hours researching under laboratory conditions the Mystical University of Glastonbury has announced the outcome of a three year study into the behaviour of soap in showers. Although their conclusions may change the way we all shower in future, some observers believe the research should have been handed over to one of Glastonbury’s less mystical seats of learning when it became apparent that the behaviour of soap can usually be explained by non-mystical scientific principles. Have two bars of soap in your shower, alternating between bars ever 30 seconds. Keep the unused bar of soap on a dry flannel to remove excess moisture. If you drop your soap, turn off the shower and stand on your bathroom floor without a towel for one minute. This form of extreme training quickly teaches you to keep a moderately firm grip on your soap. If your inferior soap brand regularly achieves a moistness coefficient greater than 30% while showering, consider switching to Procter & Gamble’s Safeguard Extreme range of soaps. These have been clinically proven to almost completely eliminate drops through the use of an ingenious cord attachment. This entry was posted in Glastonbury Tor and tagged dropped soap, Gary Rawlinson, moistness, Mystical University of Glastonbury, Procter Gamble, research facilities, safeguard extreme on by revsorg. This year was always going to be a tough one for Jeremy the pig-tailed macaque. Pressure is mounting in the run-up to the maiden voyage of the Mystical University of Glastonbury’s Astral class rocket. Jeremy was selected in preference to a human project leader following cut-backs in university funding for the space program. But the need to maintain tip-top fitness levels while attending full time physics, telemetry and language classes may have been too much for this brave monkey. Chief Rocket Engineer and university spokesperson Gordon McStevens explained; “The problem is children’s pain killers – delicious sweet pink liquid. Because pig-tailed macaques are the size of human children our veterinary consultant suggested we should give it to Jeremy to help him with the aches and pains of exercising. But it turns out that while it’s entirely safe for children, it is heavily addictive for monkeys – it makes him go totally wild”. Jeremy has been banned from chemists in Glastonbury, and has taken to running around the university campus screaming “More crack! More crack!” – his name for this delicious painkiller. Visitors to Glastonbury have been asked to be on their guard if approached by Jeremy as he tries to get shoppers to buy painkillers for him. “We have had reports that this well-spoken monkey has recently been harassing shoppers in Glastonbury, paying above the odds to fuel his terrible addiction. He is small – only a child to your eyes – and many people have been taken in by his increasingly fantastical hard-luck stories. He usually explains to innocent shoppers that he left his wallet on the bus and has a splitting headache”. Wilkinson continued; “But you need to remember that he doesn’t know when to stop. He doesn’t even use the little measuring cup, he drinks it straight from the bottle, and then the residents of Glastonbury have to pick up the pieces – we don’t want to endure another night of rampage”. 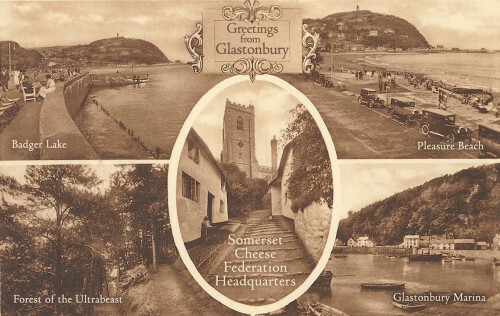 This entry was posted in Glastonbury Tor and tagged Chief Inspector Wilkinson, Chief Rocket Engineer, glastonbury chemists, glastonbury constabulary, Gordon McStevens, Jeremy, monkey crack, Mystical University of Glastonbury, pharmacy, pig tailed macaque, space program on by revsorg. It must be something to do with geological features in the United Kingdom that so many harbour ancient myths about terrifying creatures that lurk in darkness – take for example the Loch Ness Monster and the Wookey Hole Gerbil. Visitors to Glastonbury Tor have long avoided the northern slopes, covered in ancient woodland, and known locally as The Forest Of The Ultrabeast – a name censored for many years from the guidebooks provided by the Glastonbury Tourist Information Centre. Folklore has it that since mediaeval times a dangerous creature much like Bigfoot (albeit with feet sized more appropriately for the local environment) has lurked in this deeply wooded area. It was only when electric street lighting was introduced in Glastonbury in the 1960’s that a night-time curfew was finally lifted. But mention of the Ultrabeast still strikes fear into nervous local residents. This entry was posted in Glastonbury Tor and tagged A361 bypass, ancient woodland, Chief Mystical Consultant, congestion, Coppicing, Forest Of The Ultrabeast, gift shop, Glastonbury Tourist Information Centre, logging operation, National Trust, United Kingdom, Uther Henge on by revsorg. A palpable sense of excitement was buzzing in the air today as staff at the gift shop at Glastonbury Tor listened to You & Yours on Radio 4. Chief Gatekeeper Titania Bonham-Smythe had sent an email regarding a recent unsuccessful book purchase on Amazon – known as Spamazon – and we are pleased to say that it was read out by Winifred Robinson. Download the 38 second MP3 or listen to the full 41 minute You & Yours programme on the BBC website. This entry was posted in Glastonbury Tor and tagged BBC, Chief Gatekeeper Titania Bonham Smythe, gift shop, Glastonbury Tor, Titania Bonham-Smythe, Winifred Robinson on by revsorg. Visitors to Glastonbury Tor were alarmed this morning when they discovered that work has started on the huge job of slicing through the base of the Tor so it can be transported hundreds of miles to the Olympic Games opening ceremony on 27th July. The Tor will be placed on a specially constructed rocket transporter that is on loan from the aeronautics department of the Mystical University of Glastonbury, and will then be driven along the M4 motorway in time to feature as the centrepiece of the extravaganza at the start of the Olympic Games. Because it is a wide load the Tor will occupy two lanes, only leaving one lane for overtaking. The AA has warned motorists to expect delays. This entry was posted in Glastonbury Tor and tagged Chief Stairmaster Paul Hompkins, Glastonbury Pilgrims Union, Kendal Mint Cake, Mystical University of Glastonbury, National Trust, Olympic Games, opening ceremony 2012 on by revsorg. Visitors will soon be able to ride to the top of Glastonbury Tor without suffering aching legs – a complaint known locally as “Glasto-calf”. This follows agreement by the planning committee this week to allow an escalator to be installed on the steepest slope – the final 100 metres of the tor. The need for some form of automated transport has become an increasingly important issue as Glastonbury Tor has grown by 30 metres over the last decade. The cost of the escalator will be funded partly by a grant from the Glastonbury Signwriters Guild, with the remainder recouped from advertising that will be displayed to visitors as they ascend and descend the tor in style. As might be expected, news of the escalator has divided the community, with some people claiming that it is a wonder of modern science, while others claim that it discriminates against owners of larger dogs whose owners are not able to carry them for such a long escalator journey. Owners of small dogs are of course rejoicing in the fact that their dogs will be able to enjoy the view from the top of Glastonbury Tor, as their owners will have no trouble supporting their weight on the long escalator ride. The local developers responsible for the escalator proposal are very relieved as this was the second planning application. It follows the refusal of the first proposal that included a moving walkway that would have carried visitors all the way from the middle of Glastonbury town to the base of the tor. Visitors would then have switched to the escalator for the final stage of their journey. This was deemed too disruptive as the path of the moving walkway crosses several major roads that would have needed to have been rerouted. This entry was posted in Glastonbury Tor and tagged dogs, escalator, Glastonbury Signwriters Guild, planning permission, small dogs on by revsorg.